I’m Johnny Jackson. 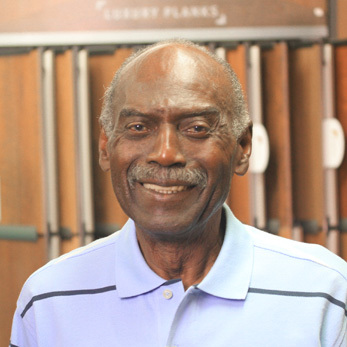 I’ve worked at Southern Carpet Hardwood and Tile since September 1957. I was an installer for 50 years and have been the warehouse manager since 2008. As an installer, two of my most memorable jobs were the Alabama Theater and the South Central Bell building, both here in Birmingham. We did the Alabama Theater back in the early 1980’s, and it was exciting work in such a historical landmark. We installed carpet on 29 floors of the South Central Bell building. That is the largest installation job I ever worked on. Southern Carpet, Hardwood and Tile is a great place to work. I can’t imagine being anywhere else.